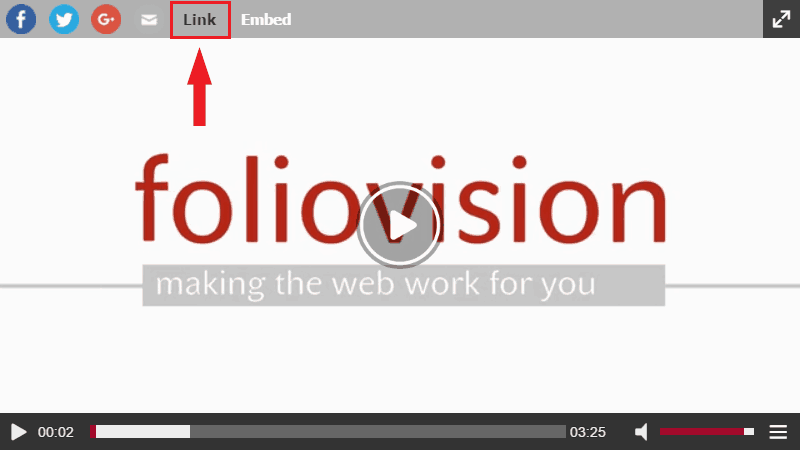 Video Links is a viewer-oriented feature that allows users to create a link to a specific part of a video posted on your page, regardless of where it's hosted. When someone clicks on the link, he will be redirected to the page where the video is posted and will be moved to the video itself, which immediately starts to play at the designated time. It's very similar to linking to a specific time in a YouTube video. Every viewer of a video can use the feature by clicking the button "Link" in the top control bar, right between the social media sharing buttons and the Embed button. After clicking, a message will appear that will say "Video Link Copied to Clipboard". The player will use the current time of the playback to generate the link, so if you want to send someone a link that will start at 2:35, just jump to that time on the timeline, pause the video and click on the Link button. After you paste the link somewhere, you will see that it will contain the page URL along with the video name as anchor, and a time mark. For example, the link below will take you to the blog post where this feature was announced and starts to play the video at 0:19. The Video Links feature is active by default. If you for some reason don't want to use it, you can deactivate it in Settings > FV Player > Setup tab > Sitewide FV Player Defaults. Here check the box Disable Video Links.